Info "Outta my way! I have a really stinky thing, and I'm not afraid to use it!" Crowd Control is a microgame in WarioWare: Smooth Moves. It appears in Wario's stage and Tiny Wario's stage. During gameplay, the player will use the Wii Remote pointer to hold a stick on the screen. The stick will have either an old sock, a stink bug, a piece of poop, a rotten apple or a skunk. 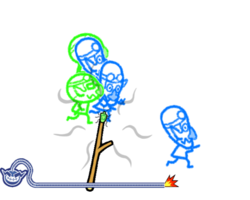 The player must move the stick around to make the crowd of people that look like Wario run off the screen. If they all do, the player wins. 1st level difficulty: There are very few people to scare away. 2nd level difficulty: There are more people to scare away. 3rd level difficulty: There are a lot of people to scare away. This page was last edited on July 5, 2018, at 18:56.